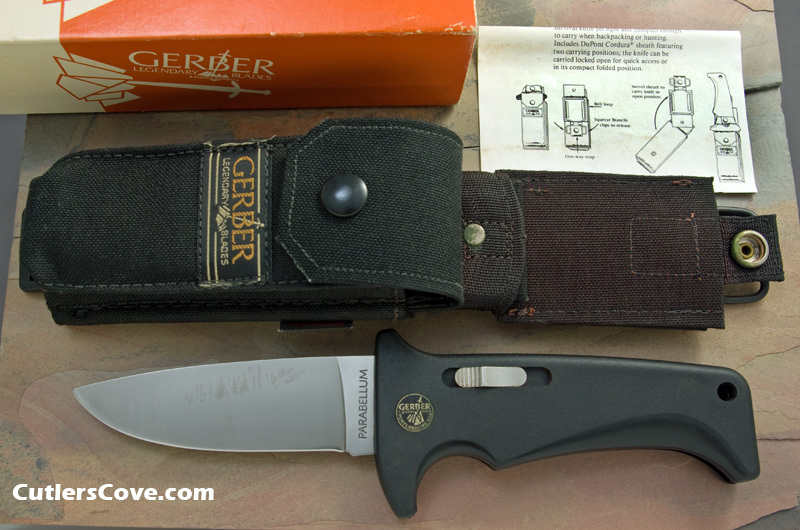 Gerber Parabellum Bolt Action with black handle that is in near mint condition and 5-1/4" closed with 4-1/4" drop point blade. The blade has light tarnish from storage but no pitting or rust. The knife is mint except for this and has not been sharpened or used. Comes with the very original sheath system with wide belt loop and ALICE clips allow the knife to be attached to standard issue military battle dress and harnesses. Orange box and papers. A very strong and over built locking knife that can function like a fixed blade, yet not heavy.